The NAB, which represented broadcasters nationally since 1922, had low participation by broadcasters in Michigan. With the Michigan state government interpreting and applying certain tax laws affecting broadcasters, Milton Greenebaum, owner/operator of WSAM/Saginaw invited broadcasters throughout the state to a meeting to discuss their mutual problems. The meeting was held on December 2, 1948 and included the owners or representatives of over half the state’s radio stations. The major point considered that day was the inequality of the state sales tax and use tax as they were applied to radio broadcasters, in contrast to the way they were applied to newspapers. 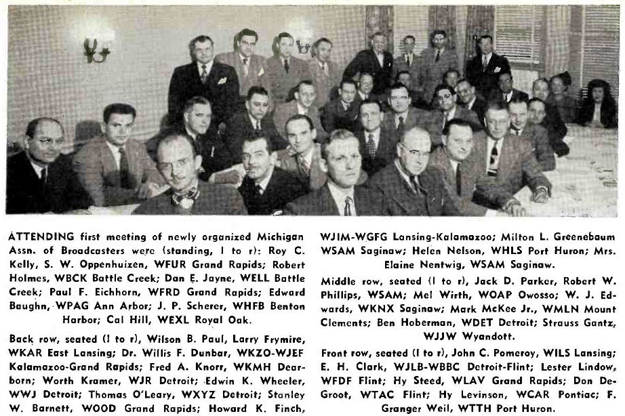 It was the rallying point around which the Michigan Association of Broadcasters was founded. Incorporation papers were filed in Lansing on January 13, 1949. Offices were established rent-free at WJIM in Lansing. When the MAB was formed in 1949, there were just 55 AM radio stations, 23 FM stations – and a mere 5 TV stations licensed in the state. 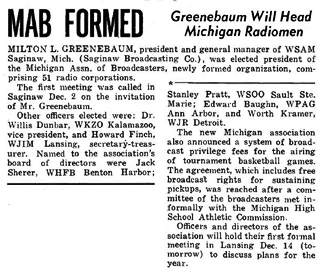 The first elected President/Chairman of the MAB was Milton M. Greenebaum from WSAM Radio in Saginaw. Dr. Willis Dunbar of WKZO/Kalamazoo and WJEF/Grand Rapids became the MAB’s first vice president; and Howard Finch of WJIM/Lansing and WGFG/Kalamazoo was elected secretary-treasurer. The association was founded for radio stations; but television stations were soon invited to membership. With television in its infancy – and television only available in Detroit, Grand Rapids and Lansing – radio still ruled the airwaves throughout the state with music, news, dramas, soap operas and entertainment programming. Families would gather together at night in their living rooms and listen to the radio. The Lone Ranger originated from Detroit’s WXYZ. Scriptwriter Fran Striker created the Lone Ranger, his horse Silver, and his sidekick Tonto. The radio program ran from 1933 to 1954 and the television series from 1949 to 1957. Ventriloquist Edgar Bergen of Decatur was the voice of Mortimer Snerd, Charlie McCarthy and Effie Klinker. As television expanded throughout the state in the 1950s, it quickly took over in areas that radio had dominated: comedy, drama and news. Popular programming included the first popular network television show for children “It’s Howdy Doody Time!”, created by its host Buffalo Bob Smith. Chet “Buck” Barry left his traveling Wild West show in 1953 to host “Buckaroo Rodeo” for WOOD-TV in Grand Rapids. And a slapstick comedian named Milton Supman became Soupy Sales on Detroit’s WXYZ-TV and found an audience of young but adoring fans. MAB Presidents/Chairmans through the rest of the association’s first decade included Stanley Pratt, WSOO/Sault Ste. Marie (1950); Edward F. Baughn, WPAG/Ann Arbor (1951); Dan Jayne, WELL/Battle Creek (1952); W.A. Pomeroy, WILS/Lansing (1953); John F. Wismer, WHLS/Port Huron (1954); Fred Knorr, WKMH/Dearborn (1955); Carl E. Lee, WKZO/Kalamazoo (1956); Jacob P. Scherer, WHFB/Benton Harbor (1957); and Martin Giaimo, WJEF/Grand Rapids (1958). The Carl Lee audio interview originally appeared in the February, 2009 issue of the MAB E-Newsletter.